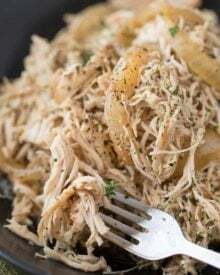 This crockpot shredded chicken is made with chicken breasts, spices, broth and beer which makes for an ultra tender and flavorful shredded chicken. 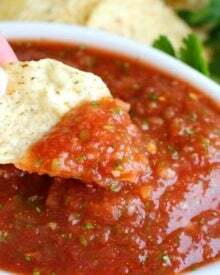 It’s all purpose flavor makes it great to use for tacos, baked potatoes, nachos, and more! 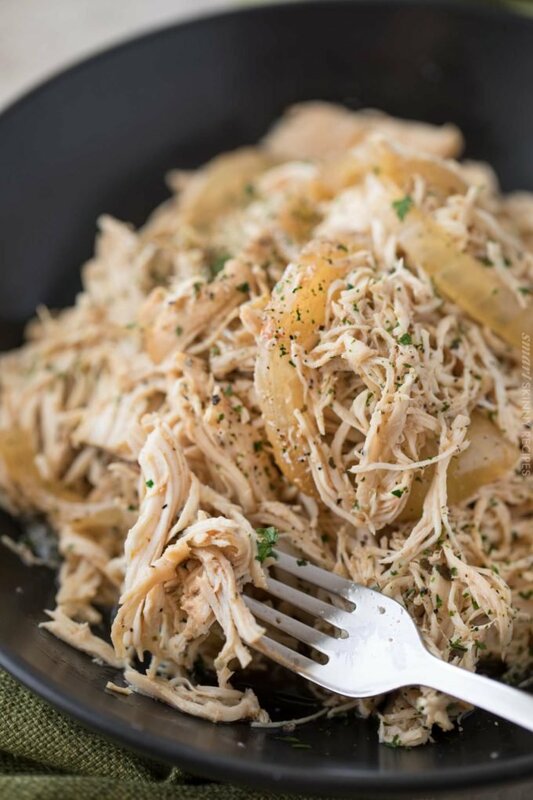 When time is tight during the week we like to make a big batch of this beer braised crockpot shredded chicken and use it for several meals throughout the week! At just 1 freestyle smart point per serving, you’re free to add sauces, salsas and other mix-ins to flavor this chicken up any way you’d like! What’s the most common protein you cook in your house? For us, it’s chicken. Beef is probably a close second… but now that we’re eating a little healthier, it’s mostly chicken. The only problem there is that we all tend to get into dinner ruts, where we make the same thing over and over again, right? I know we do. When the kids actually like a meal, we definitely make note of it and it goes in our permanent dinner rotation! 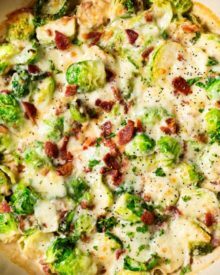 Between the dinner ruts and crazy hectic weeknights, dinner can be a hassle! 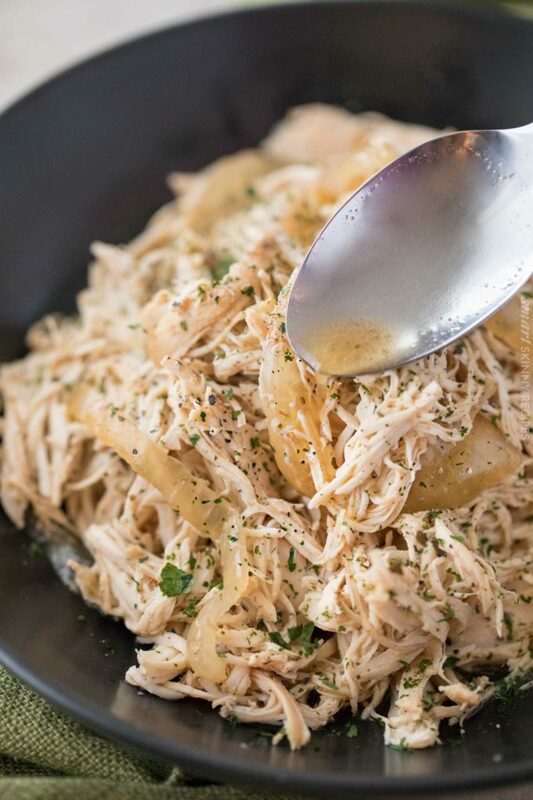 That’s why I love this all-purpose shredded chicken! You can make a big batch and use the leftovers to make different meals throughout the week! 3-4 days is what I typically do. On about day 2-3, any extra leftovers that I know I won’t eat in the next one to two days, I package into freezer ziploc bags and freeze. Frozen shredded chicken is safe for 1-3 months. I like to use darker beers for this, as they tend to have a higher percentage of alcohol, which is what really tenderizes the chicken. 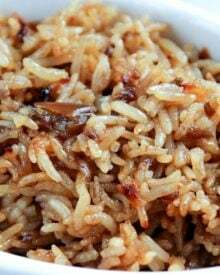 Plus I just like the taste with the hint of brown sugar in the seasoning mix. But since you’re making this recipe for YOU… choose a beer that you know you love. If you know you hate to drink IPA’s, then don’t use that here. The beer flavor will intensify! The first night, we love this chicken on it’s own, with some vegetables as a side, or maybe over some egg noodles. But for the rest of the week, we’ve used this chicken in just about everything! Mix in some corn, black beans, jalapeno, etc. and top some baked tortilla chips. Add a sprinkle of cheese and broil for some tasty chicken nachos. The sky is the limit here! The beer flavor isn’t SUPER prominent, so the shredded chicken can really blend into just about any meal you want to make. Yes! The great thing about using an instant pot is that you can actually use frozen chicken breasts too, so if you didn’t have the time to defrost them, it’s okay. Add all ingredients to the pot, lock the lid in place and set valve to “seal”. Manually select high pressure and select 10 minutes. When the chicken is finished cooking, do a natural pressure release for 10 minutes (then do a quick pressure release to get rid of any remaining pressure). Shred the chicken and you’re good to go! 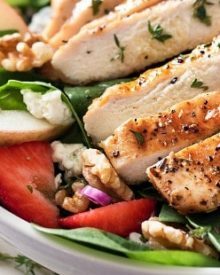 Fresh chicken breasts usually come to pressure in 10-15 minutes, but using frozen chicken breasts will make this take a little longer. The actual 10 minute cook time is the same for both frozen and fresh though. 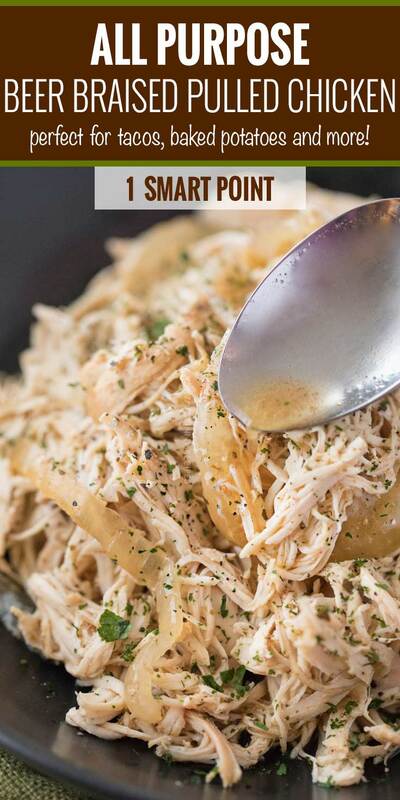 I hope you all give this healthy crockpot shredded chicken a try! 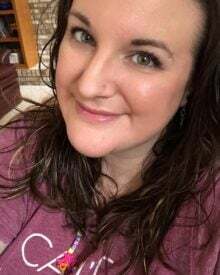 Slow Cooker – I’m a huge fan of Hamilton Beach slow cookers, and I love the latch on this one so you can transport it! 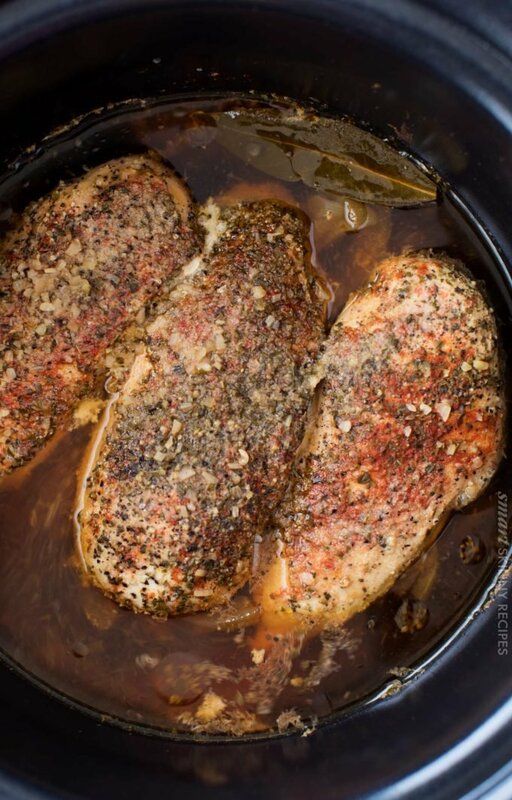 Instant Pot – If you don’t have one, it’s really an invaluable kitchen tool! I’m starting to use mine more and more! Bear Paws – seriously the best thing ever when it comes to shredding meat! 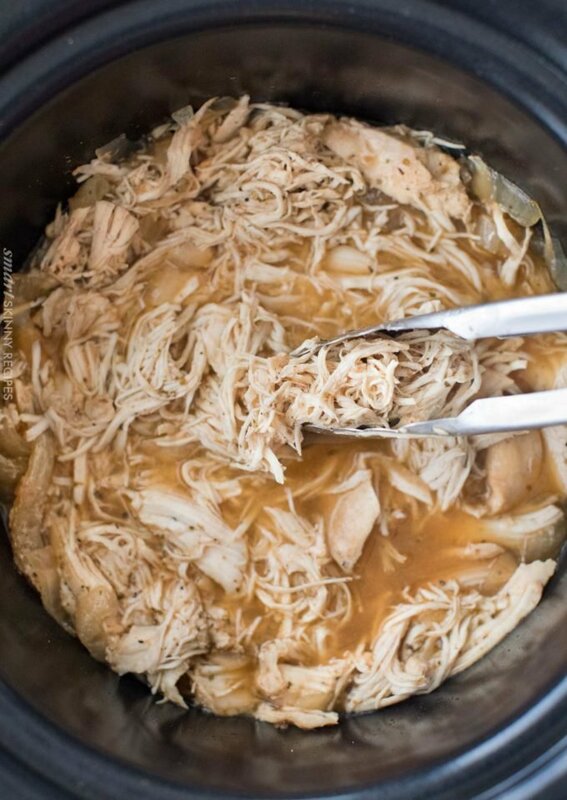 This crockpot pulled chicken is made with chicken breasts, spices, broth and beer which makes for an ultra tender and flavorful shredded chicken. If using onion, add to bottom of slow cooker. Top with chicken, then all seasonings. Rub seasonings into the chicken. Pour beer and chicken broth into the slow cooker, cover, and cook on LOW 5-6 hours, until chicken is tender and shreds easily with a fork. Chicken can also be cooked on HIGH for 2-3 hours. Shred chicken with two forks and serve with extra juice on the side if desired. Store leftovers in the refrigerator, sealed, for 3-4 days (only reheating the portion you want to eat). Alternately, place shredded chicken into freezer ziploc bags and freeze for several months (make sure they're well sealed). If your chicken broth isn't reduced sodium, reduce salt amount down to 1/2 tsp. For a stronger beer flavor, add up to 12 oz of beer. How much of this recipe is one serving? Thanks! 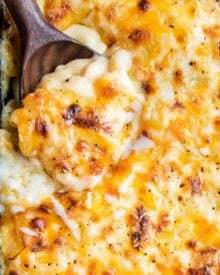 Overall delicious, I made it the other day and have loved how versatile it is! I used less beer and more stock as I’m not a big fan of beer. I used a Summer Shandy thinking it’d give a little lemon chicken flavor, but I think I’d use a different beer the next time I make it. Definitely making again though, yum! i know beer is a main component of this but what alcohol free alternative do you suggest ? same amount of stock? I’ve only tested the recipe as written, so I can’t say for certain that the flavors won’t be altered too much… but yes, I would use the same amount of stock. 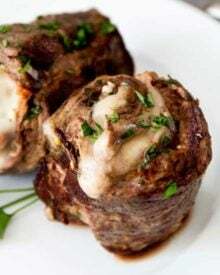 Can you use drumsticks instead for this recipe? This looks so good and easy. As I don’t want alcohol in it I was wondering would white grape juice or ginger ale work? Is it used for just flavor or for tenderness? Thanks! This chicken is so tasty! I love it for meal prep for a whole week! This looks so good! I love how juicy it looks! This chicken is so versatile! I could use it with soooo mnay dishes. Yum! So easy and versatile!